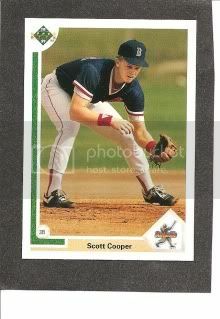 Scott Cooper is a third baseman who played in 261 games for the Pawtucket Red Sox between 1990-91. Which is when I was there, but we didn't like date or anything. Whatever. In 1990, at age 22, Cooper hit 12 home runs in 124 games. Somehow, this only translated into 44 RBI. I wonder where he usually played in the lineup? Imagine a website with every lineup for every game ever played in the history of OB. GALACTIC. Cooper fared a bit better in '91, leading the team in games played (137), RBI (72), HBP (7), hits (134! ), and intentional walks (11). But wait, there's more! Cooper was second in the International League for games played that year. AND HE WAS NUMBER ONE IN INTENTIONAL WALKS! Alright, Hamilton! 1. Scott Cooper's backup third base-iness resulted in Jeff Bagwell being traded to Houston for uninteresting reliever Larry Andersen. Scott Cooper is ready and waiting for you in the middle portion of the home plate tower. "sure, we'll trade you Bagwell - we have Scott Cooper in the pipeline!"